Did you know nearly two thirds (64%) of adult Americans would like to see their insurance cover massage therapy? That certainly says a lot about the number of visits paid to the massage therapists’ rooms, not to mention the costs involved. We certainly don’t all have the luxury or means of making such frequent trips to the spa for a massage. Could having your own back massaging chair provide a feasible alternative? Better yet is it as effective? Below we put together a list of reviews of the best massage chairs. Thanks to technology and its continuous innovations, you can get a massage in the comfort of your own home without visiting the spa or a chiropractor. Before we go any further let’s discuss what a back massaging chair is and if it really works. Why Choose a Massage Chair? A massage chair contains internal electronic motors and gears designed to massage the person sitting in it. Think of it as having your own personal masseuse always at your service. These chairs are designed to mimic the hand motions of a massage therapist. Wondering how they first came about? The first electric massage chair was invented in Japan before World War II and the first robotic massage chair was brought onto the market in 1954. Since Japan pioneered these chairs it makes sense that a survey suggests over 20% of Japanese households actually own a massage chair. Why forego a trip to the chiropractor and opt to purchase one of these instead? Here’s why. Even though the massage chairs might be expensive they definitely beat the high cost of ongoing therapy sessions for which you pay for per session. Over time this will result in spending more than just making a one time investment. Apart from saving money you can also save another precious resource - time. With daily pressures increasing, you hardly have time for yourself, let alone time to take a trip to the spa regularly. With this gadget at home you can simply sink into this chair after a long day’s work and you’re on your way to a relaxing experience. Any device that makes your life a lot easier should be on your must have list. Say goodbye to rushing through traffic trying to meet the spa business hours. A massage chair offers the convenience of having a massage session in the comfort of your home even in front of the TV. There’s one thing you might not get when you visit a spa - privacy. Nothing is more relaxing than getting a full body massage without any unnecessary disturbances. You can simply place your massage chair in your favorite private room or study, lock the door and relax away. Let’s put it this way: Your massage chair - your rules. There’s no one to tell you the kind of massage you should get. You can simply tweak the settings and controls to suit your preference. Office style chairs: This is ideal for anyone who spends a lot of time in their computer chair at home for instance web designers. Separate chair massage pad: This is the least expensive type and can be used with an existing chair. You simply place it on your chair or couch. It’s commonly known as a back massage cushion because the pads only target your back muscles. Full featured massage chair: This type is designed to offer a full body massage as opposed to the back massage chairs mentioned above. They have slots for your arms, hands, legs and the rest of your body. Basically expect to get a massage from your head to your toes. 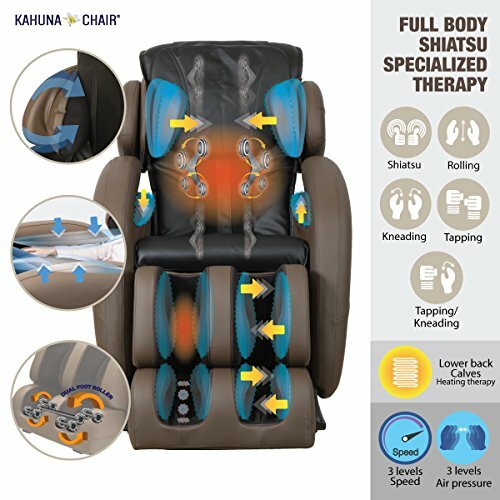 Shiatsu massage chairs: The name came from the Japanese Shiatsu technique. What is Shiatsu? It translates into finger pressure. With this chair, pressure is applied to your body’s acupuncture points by using rollers and an airbag system. 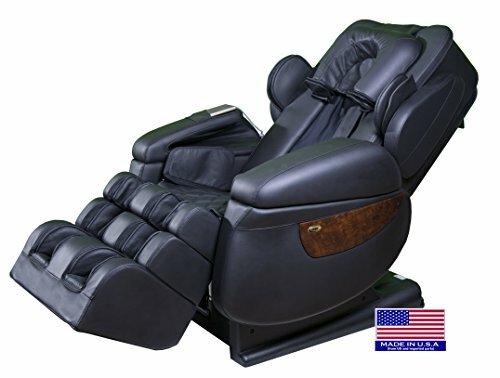 Reclining massage chair: If you’re looking for the ultimate relaxation experience you can pick one that reclines. This reclining feature is the equivalent of lying down on a massage table providing you with increased comfort. If you don’t want the hassle of manually adjusting the chair opt for an automatic reclining chair. 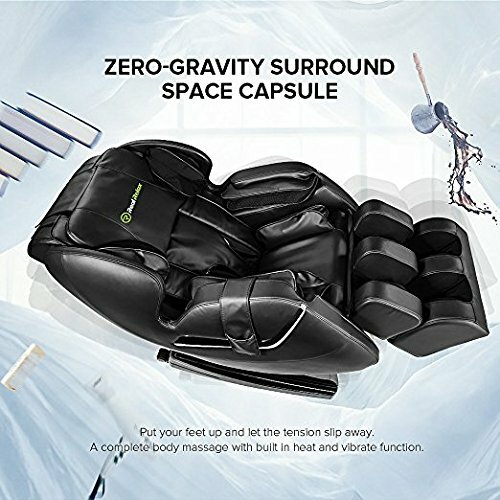 Zero gravity massage chair: Zero gravity is a term invented by NASA to describe an astronaut when they’re in that special reclined chair during launch. This position elevates your legs slightly above your heart. 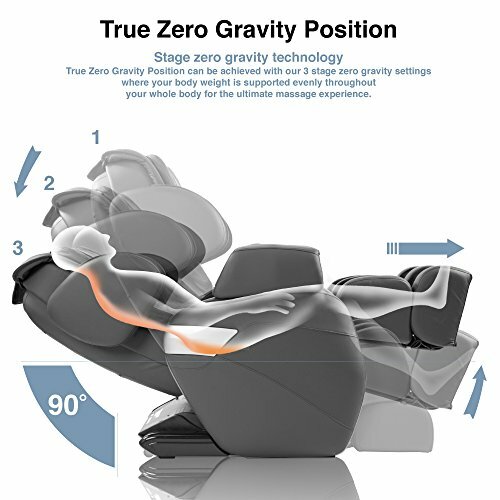 The zero gravity massage chair has incorporated this design so it’ll simultaneously increase relaxation of the neck, back and eliminate pressure on your spine. While the idea of having this chair in your home sounds appealing, what benefits can you hope for? Is it worth spending so much money buying a massage chair when you can simply use a massage cushion? Looking to sit back, relax and just enjoy a well deserved back massage? Then this advanced 3D robotic massage will provide you with outstanding lower back massages. Experience the three layer foot and calf massage and your feet will definitely be in for a treat too: Enjoy the advanced sole massagers with double rollers and a removable pad. This model comes with full body heat particularly focused on the feet, back and seat. 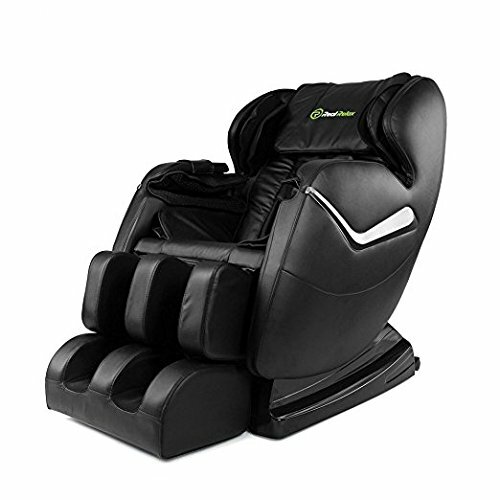 What’s unique about this product is it has a fully functional seat swivel with twist stretching that’s not found on any other massage chair. You can also expect comforting acupuncture point arm massages. Comfort is guaranteed because this massage chair is made of genuine leather at all massage touch points such as the head, arms, shoulders and feet. To top it off you can enjoy this ultimate massage experience while listening to music thanks to the integrated MP3 music system. 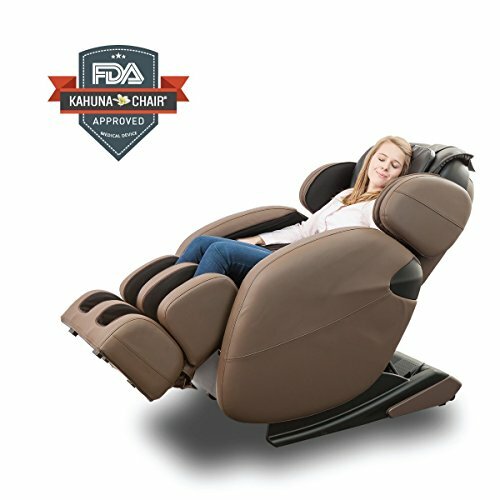 To minimize your safety concerns this massage chair is FDA listed making it safe for all members of your family to use - kids too. It has five user memories so you can customize and save your massage settings for the next time it’s your turn. That’s magic! Check current​​ price. This is rated one of the best high end massage chairs. Why? It embodies both affordability and exceptional quality. 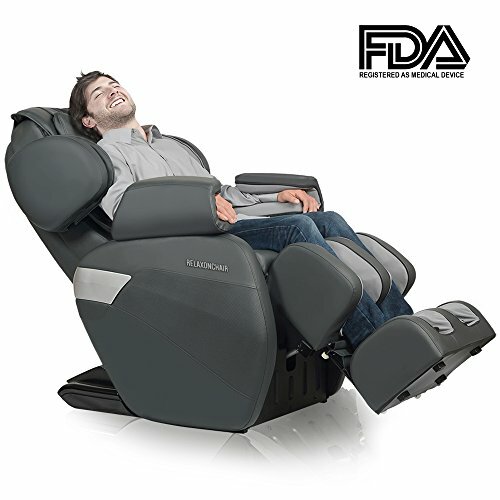 Cut down your trips to the spa by investing in this Relaxonchair which offers the ultimate full body massage experience in the comfort of your home. It’s designed with innovative rollers that mimic your spine’s natural shape and these rollers glide from your upper back all the way down to your glutes. The L track innovation system is specifically designed to deal with back pain or sore glute muscles so you’re guaranteed relief in those areas. You can enjoy a deep tissue massage throughout your body and you’ll love the soft grained synthetic leather. Simply follow an easy three step process to install this chair and you don’t need any tools to do so. It features four fully automated programs designed to mimic the actions of a professional massage therapist. This chair moves you according to a calculated routine and slowly stretches out the leg & back muscles. Whether you’re looking for kneading, tapping, Shiatsu or rolling, this is the chair to pick because it has five manual specific target massages. Another useful feature is the built in sensors which automatically detect the length of your spine making for a personalized therapeutic massage. You’ll also like the uniquely designed airbags that are strategically located throughout to inflate and deflate while providing ultimate muscle tension relief. Check current​​ price. If safety is your priority pick this FDA approved massage chair. This all in one chair has four rollers & an air cell massage system designed to effectively massage your shoulders, arms and hips. Your back will be well supported thanks to the L track frame structure designed to support your neck & back, all the way to your buttocks. Enjoy a custom fit body massage since this chair scans your body size automatically before massaging. You can enjoy your massage in peace because this model runs quiet thanks to the air cell massage system with a minimal number of air cells. These air cells are programmed to inflate separately thereby massaging and stretching your body. Because of its ergonomic structural design you can store it anywhere in your home. If you want to keep it in your living room but don’t want the chair looking out of place, it’s possible. Thanks to the space saving technology that only requires three inches from the wall during zero gravity position, you can easily align your chair with other furniture. Missed your yoga class? Why not combine your yoga routine and massage session with this chair which has a yoga stretching program designed to stretch your entire body. Ch​​eck current price. This is one of the best massage chairs you can find in the mid-range price: Get a premium look at a reasonable price. 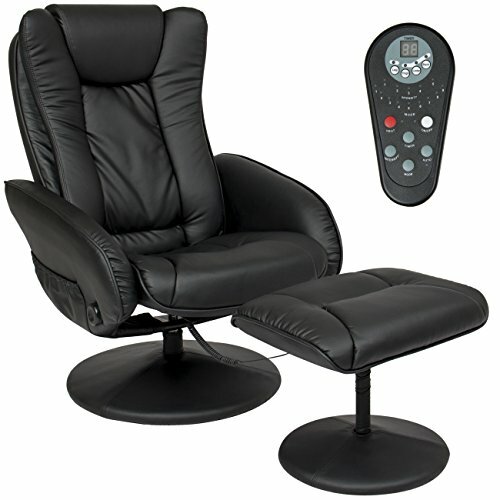 This massage chair comes with a remote controller which has an advanced high definition display screen. You can decide to set your manual programs to massage your foot or back independently. Unlike most back-massage rollers which go up and down this chair has eight rollers which move around in the same place for a more effective deep tissue massage. The treatment includes vibration, heat and air squeeze. Bonus: It has 50 air bags placed all over including the shoulders & arms for an effective massage. If you want to take a quick nap during your massage you’re able to do so comfortably thanks to the recliner. For those cold winter days you can make use of the built in heater inside the seat or simply use it to promote your blood circulation & improve metabolism. For easy maintenance it’s made of PU leather making cleaning a breeze. The chair has two wheels for portability when moving it around the house but note that it’s quite heavy. Che​​ck current price. 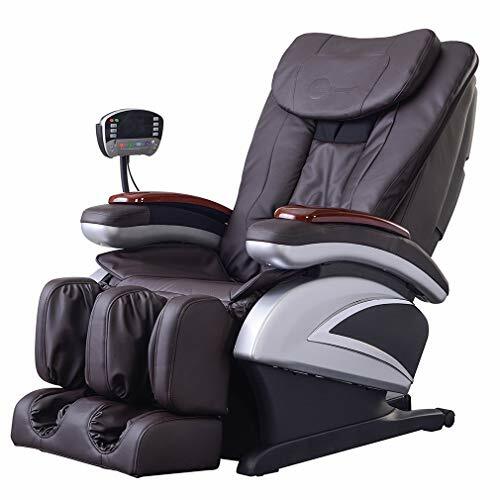 Expect to rejuvenate your mind and body by picking this massage chair. The power rollers will relax muscle stress and consequently reduce fatigue. The chair is designed to improve flexibility, mobility and posture of your legs because of its compression & percussion capabilities. Enjoy a massage that reaches high up to your neck and low down to your tailbone section thanks to the ultra-long-range massage feature. This massage chair has over 30 airbags: 20 are in the lower body of the chair to provide massage for the legs, thighs and feet. The built-in heat intelligent roller system will promote blood circulation to the lower parts of your body. The chair is designed to conform to the contour and shape of your spine plus the added neck feature specifically targets stress relieving points on your neck. Customization is easy since it has multiple levels of intensity from strong to weak all done via the user-friendly control panel. Reduce muscle pain with the kneading massage function which is also designed to work out knots. Another useful feature is the high-power vibration motor and air pressure massage motor for an effective massage experience. This model is designed to automatically raise and recline the backrest & foot/leg ottoman so you can find an ideal position. Check current p​​rice. Looking to relieve pain in those sensitive areas? You’ll like this massage chair which is designed to reduce pain in your upper & lower back, thighs and feet. You can select the area you want to target, the intensity of the massage as well as heat produced. All gets activated with a wireless massage remote controller. If it’s comfort you’re after, this has an ergonomic recliner function for comfortable seating and a detachable massaging ottoman that allows you to relax your feet. Add style and comfort to your massage routine by including this classic massage chair in your living room furniture. It has a soft cushioned seating and a double padded backrest which is perfectly crafted using PU leather upholstery. Cleaning won’t be a hassle thanks to these maintenance friendly surfaces. Check current price. Considering the money involved in purchasing one of these, let’s help you make the right selection. Swedish: This is the most common form and it involves gentle rubbing and intermittent application of pressure. Shiatsu:This type involves applying pressure to the body’s acupuncture points. It may feel a little rough and painful to those not used to it. Kneading, rolling & rapid percussion:These types involve slow and deep applications of pressure to target different muscle groups. This type makes use of built in rollers and balls. Pressure therapy:This technique uses airbags to emulate the level of muscle compression you get from real human hands. It’s ideal for those who want massage therapy for their neck, arms and legs. Yes, the design and size of the massage chair you pick matters. While it may have looked good in the showroom will it fit in your living room? Did you know if you pick a chair that offers neck, back and leg reclining you can’t place it in a corner or against a wall without hampering its functionality. Massage chairs are generally big and the unique design usually makes them stand out. Determine if it’ll blend in with your living room furniture. Reclining options: Consider if the chair has back & neck reclining options if this is vital for your treatment. Cup holder:You need one in case you want to enjoy a drink while having a massage. Memory functions:A chair with memory functions can save your settings which is handy if more than one person uses the chair. Always having to program your massage settings can be annoying if you just want to sit down and relax. Quality construction: A quality massage chair will work for a long time without you needing to spend money on repairs, even when larger individuals use it. Rollers and airbags: These are found inside the chair and rely on vibrating mechanisms to provide you with an effective massage. Make sure they’re comfortable and not too intense. Decide what’s important to you and only pay for what you really want. For such a pricy investment ensuring it’s covered by warranty goes without saying. The maintenance and repairs involved when you own a massage chair aren’t something you should take lightly. Make sure the warranty is reasonable and lasts for at least three to five years. Always check what exactly the warranty covers as some manufacturers might have partial coverage on specific elements of the chair such as ‘mechanism only’, instead of all features. Prices of massage chairs vary depending on the model and functionality. Be prepared to spend anything from $200 to $8000. An average good quality chair goes for around $2500. You may also find quite a few affordable massage chairs under $1,000. What Brand of Massage Chair is Good for You? The US and Japanese owned brands are the best because of their consistency in quality checks & aesthetic designs. Are Back Massage Chairs Good for You? Apart from easing aches & pains back massage chairs can help lower stress and help with relaxation. This ultimately results in a positive effect on your physical and mental health. Moderation is always a good word to keep in mind when it comes to massage chairs. Over using it will end up doing more harm than good by bruising your muscles and possibly inflaming & damaging your body tissues. There you have it: You don’t have to spend huge sums of money by visiting your local massage therapist. All you need is making one worthwhile investment and enjoy a relaxing massage experience anytime you want. Whether you want a back or deep tissue massage these chairs are just as effective in giving you one as when performed by a trained therapist. Why not save time & money and enjoy a peaceful massage in the comfort of your own home? Technology makes it possible.